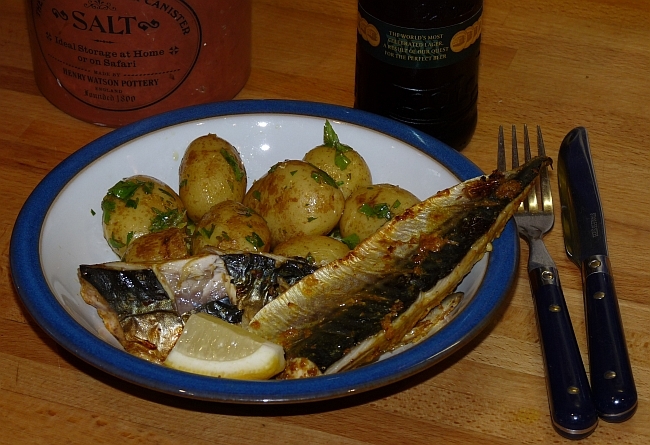 The strong flavour and firm flesh of a fresh mackerel holds up well to spicy recipes. You can even give it the Tandoori treatment if you wish. This recipe uses a more subtle spice mix and plenty of lemony flavours. I have included the warm potato salad recipe but you could use couscous, rice or warm bread to go with it. Mix together the spices and lemon juice. Slash the skin side of the mackerel fillets and rub the spice mix all over, both sides. Leave to marinate for 20 minutes. Meanwhile, make the potato salad. Boil the potatoes for 20 minutes in salted water. Drain, and while still warm, mix with the parsley, lemon juice, zest and spring onions. That was easy. Now grill the mackerel fillets, skin up for 5 minutes, turn over, and grill for 2 minutes more. That was even easier. Serve with the potato salad. It is very lemony so you may not need the lemon slices but they make it look good.